The Japanese American National Museum presents “Marvels & Monsters: Unmasking Asian Images in U.S. Comics, 1942-1986” from Oct. 12, 2013 to Feb. 9, 2014. Through a selection of images from comic books representing four turbulent decades, “Marvels & Monsters” illustrates how evolving racial and cultural archetypes defined America’s perceptions of Asians. 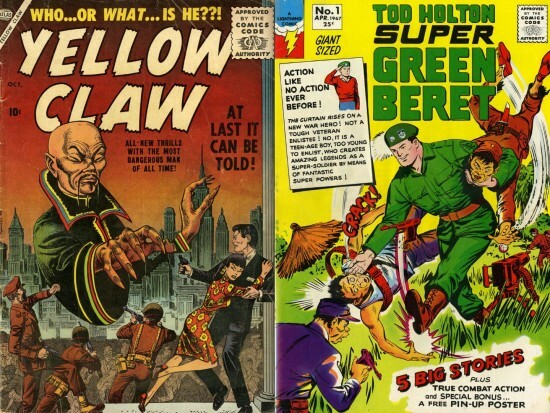 This exhibition draws from noted science fiction author and cultural studies scholar William F. Wu’s comic book collection — the largest archive of comic books featuring Asians and Asian Americans — that was donated to the NYU Fales Library & Special Collections through the Asian/Pacific/American Institute at NYU. Curated by “Asian Pop” columnist Jeff Yang, this exhibition is a unique and fascinating look at how the images and characters of Asians and Asian Americans featured in comic books during times of war and unrest coalesced into archetypes that still remain today. The exhibition places a selection of noted archetypes — Guru, Brain, Temptress, Manipulator, Alien, Kamikaze, Brute, and Lotus Blossom — within both a historical context and a comparative discourse with contemporary Asian American writers and creators, including Ken Chen, V.V. Ganeshananthan, Larry Hama, David Henry Hwang, Naomi Hirahara, Genny Lim, Greg Pak, Vijay Prashad, and Gene Luen Yang. The exhibition also contains elements designed to encourage direct engagement with the archetypes, such as life-size cutouts of the eight archetypes that allow visitors to put themselves “inside the image” and an installation called “Shades of Yellow” that matches the shades used for Asian skin tones in the comics with their garish yellow Pantone. “Marvels & Monsters” ends with a library of present-day graphic novels by Asian American creators and an area where visitors can color original heroes designed by Bernard Chang (“Supergirl”) and Jef Castro and Jerry Ma (“Secret Identities”). A free preview reception for “Marvels & Monsters” will be hosted by the JANM Young Professionals Network on Thursday, Oct. 10, from 6 to 9:30 p.m. The preview will debut original monologues and short performances in a special showcase. These winning pieces will commemorate JANM’s West Coast premiere of “Marvels & Monsters” by rethinking, subverting, deconstructing, or satirizing the eight Asian pop culture archetypes depicted in this exhibition. Public programs that accompany the exhibition include a comics-themed Target Free Family Saturdays event on Oct. 12, which will celebrate the official opening. On Oct. 19, Lela Lee, author and artist of the comic book series “Angry Little Girls,” will discuss her comics and their impact on Asian Americans and beyond. “Marvels & Monsters” is a collaboration between JANM and the Asian/Pacific/American Institute at NYU and the NYU Fales Library & Special Collections. JANM is located at 100 N. Central Ave. in Little Tokyo. Museum hours: Tuesday, Wednesday, Friday, Saturday, and Sunday from 11 a.m. to 5 p.m.; Thursday from noon to 8 p.m. Admission: $9 for adults, $5 for seniors, students and children, free for museum members and children under 6. Admission is free to everyone on Thursdays from 5 to 8 p.m. and every third Thursday of the month from noon to 8 p.m. Closed Mondays, 4th of July, Thanksgiving, Christmas, and New Year’s Day. For more information, call (213) 625-0414 or visit www.janm.org. He began his career as founding editor and publisher of the pioneering Asian American periodical A. Magazine and as a cultural critic for New York’s alternative weekly The Village Voice. He can frequently be heard as a contributor on NPR’s “Tell Me More,” PRI’s “The Takeaway,” and other public radio programs. He, his wife Heather, and his sons Hudson and Skyler live in Brooklyn. To see his Wall Street Journal blog, go to http://blogs.wsj.com/speakeasy/tag/tao-jones/. The A/P/A Institute at NYU has produced programming, publications, exhibitions, new research, and a long-running artist-in-residence program, attracting leading academics and practitioners. The multiple archival collection initiatives, including the recently completed acquisition of the Jack G. Shaheen Archive, Yoshio Kishi/Irene Yah Ling Sun Collection, and the William F. Wu Collection, to the NYU Fales Library & Special Collections spearheaded by the institute have also continued to build a foundation of, and preservation and access to, important historical documents and previously overlooked materials for present and future researchers and students. The institute serves the community with public programs based off research, cultural production, and scholarship on contemporary issues facing Asian Pacific American communities and discourse. Through public programs, publications, and other resources, the institute establishes forums for dialogue and interaction between socio-cultural influencers and producers, the academy and the public. The Fales Library & Special Collections, comprising nearly 225,000 volumes and over 10,000 linear feet of archive and manuscript materials, houses the Fales Collection of rare books and manuscripts in English and American literature, the Downtown Collection, the Food and Cookery Collection, and the general Special Collections of the NYU Libraries. The Fales Collection was given to NYU in 1957 by DeCoursey Fales in memory of his father, Haliburton Fales. It is especially strong in English literature from the middle of the 18th century to the present, documenting developments in the novel. The Downtown Collection documents the downtown New York art, performance, and literary scenes from 1975 to the present and is extremely rich in archival holdings, including extensive film and video objects. The Food and Cookery Collection is a vast and rapidly expanding collection of books and manuscripts documenting food and foodways with particular emphasis on New York City. Other strengths of the collection include the Berol Collection of Lewis Carroll Materials, the Robert Frost Library, the Kaplan and Rosenthal Collections of Judaica and Hebraica, and the manuscript collections of Elizabeth Robins and Erich Maria Remarque. The Fales Library preserves manuscripts and original editions of books that are rare or important not only because of their texts, but also because of their value as artifacts.